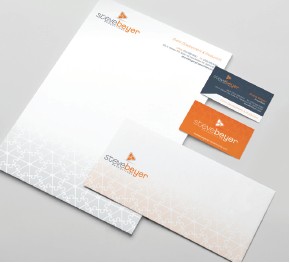 After 25 years in business, the Steve Beyer Productions branding was ready for an update, so they contacted Zee Designs. Success had grown their business from a firm with total focus on providing Talent, Production Services, and Décor for events to being a full-blown Event Planning and Production Company, providing all the original services, and so much more… and they didn’t even realize it because the transition had been so gradual! When Zee recognized this and explained it to them, their faces lit up and the excitement in the room was palpable. It was exciting! A new identity was being born, right on the spot, as their view of their own company was changed and energized. They requested a new look for their print and web materials, as well as their advertising and marketing materials. They were looking for something that had a fresh pop and reflected their renewed spirit: something that would make you say, “Wow, that’s really different and cool.” After all, entertainment and event production defines cool, doesn’t it? They were eager to have a new modern website solution to highlight their focus on event planning as well as upgrade their Talent Showcase to make it easier for people to find the right entertainment for their events. The first step would be to design the logo and brand style guide, which we would use for all the print and web media, and they would use for all their in-house materials, video branding,signage, vehicle identification, and so on. A new website would be designed to highlight the newly discovered corporate identity, and their full range of services. Delivery of information about the continuing services would be significantly enhanced with a focus on a range of conversions. The site would be exciting with colorful pictures highlighting their comprehensive and highly professional services, and the dazzling creativity of their events. In addition, a new Talent Manager web app would be developed to make it easier for administrators to add, edit, and update talent details, offer a Talent Showcase to website visitors to peruse and encourage them to interact with the Select Talent Experience; a conversion point to let Steve Beyer Production agents know of their interest in talent that would enhance their events. The plan was print materials first and website next. The new logo is sophisticated as well as playful, with clean modern styling. 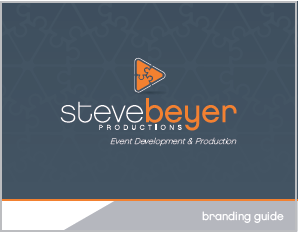 Steve Beyer Production owners and staff got so excited about their new logo and corporate identity package that they started veering off their intended path of creating a website first to applying the new branding to all their in-house needs, proposals, advertising, door signage, vehicle graphics, etc. Zee Designs kept with up that all the while developing a website solution to present to the public their newly defined focus, and the level of professionalism they have become. The new website solution has a definite WOW factor, along with sophisticated technology that showcases their business in a brand new way. Mobile-friendly and responsive screen design. Innovative use of Gallery modules for color photographic displays. Interactive tabs at the top of each page for contacting the company by phone or email with the option to add Live Chat at a future date. A colorful slideshow that highlights their services. A tabbed presentation of Talent, featured and new. Links to retrospectives of events they have done with gallery photographs. Event Experiences - retrospectives of events they have done with gallery photographs. Frequently asked questions with answers that reveal the breadth and depth of experience that this company brings to the arena of event planning and production. Team bios and contact information. Testimonials – form to submit new testimonials. A totally new, sophisticated Talent Showcase offering filtered search, labeling, selection, and inquiry that enables visitors to email SBP requests for information about talent they are interested in hiring for their events. Email forms to contact Steve Beyer Productions for questions, talent requests, event requests, and testimonials. An A to Z Directory to make finding things on the site even easier. The result is a fun site with surprises and fascinating people, events, and stories,punctuated by stunning photographs. The message is that this is a company that knows its business and creates wonderful events and experiences. More importantly, the website solution includes several conversion points to drive the business into the hands of their agents, and an interactive Talent Showcase to engage both their existing and their potential clients. The focus of this site now is the bigger picture of Event Development and Production, and of which their Talent Agency services are a part of rather than the focus. This is a big transition and they have been grateful and excited to see this moving into place.